Using the old traditional stained glass, this petite glass pendant has been carefully copper foiled and enhanced with wire ornate design using lead free solder. Every stained glass pendant is unique and carefully created with attention to detail. 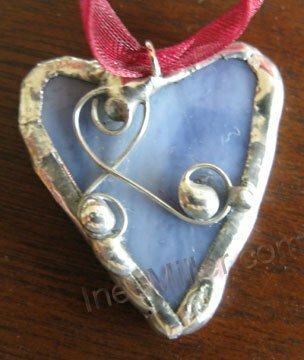 Handmade Glass pendant comes inside a silvered gift box complemented with a petite gifts tag- ready for gift giving! You are acquiring a one of a kind piece of art directly from Artist Ines Miller studio. **Color may differ slightly from different computer monitor; if you need any more images please e-mail me. I create every item individually, slight variations may occur. Your original art piece will not have the copyright water mark.